Written fresh out of an 8th Day concert at the Chabad on Campus International Shabbaton, with some 1000 Jewish college students in attendance, it’s time to finally finish something that was started a long time ago. Ink has been spilled on this album before, but let’s go with it in any case: here’s Inner Flame! Celebrate: **** In their inimitable style, we open with a bouncy remake and topical mashup of Shir Haamalos and Od Yishama. The guitar solo could have used more oomph over the bass and drums, and the synth pulling a violin there was unnecessary. A very fun song, but it could have used some more creative spontaneity to bring it over the top. Just Like You: ***** A fantastic folk-country version of this classic Chassidic tale, traditionally told of the Maggid of Mezeritch, R’ Dovber. Should become a camp bonfire regular. The banjo solo is pitch perfect: simple but elegant. 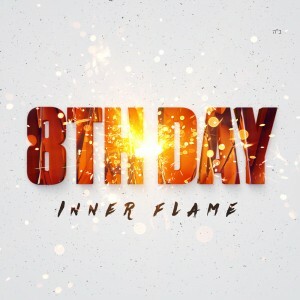 Inner Flame: *** 8th Day goes 80’s, maybe in a Back to the Future retrospect, as electro pop takes over. While it has meaningful – yet funky – lyrics, as we now know to expect from 8th Day, it’s still a bit too much on the synthetic side for me. Tears: *** A sincere and reflective ballad. Sweetness, but nothing out of the ordinary. A fine filler tune. Days R Comin’: **** Peppy pop driven by the brass. The awesome chorus with its messianic lyrics seems to be a subject continuation of their hit Didan, off their previous album. (Honestly, I think we can use this reminder nowadays…) The bass solo mid-song is something to behold as it trades barbs with the keys. Utzu Eitza: *** This number seems like it was the result of a search, in the words of certain immortals, for something completely different, and they run the full monty to get there. Yet… I dither on and off whether it whets my appetite for more of the genre. In any case, the ukulele runs the rhythm with a lot of electric percussions. The lyrics talk up the issues we face in the broader world (think: Iran) with the positive message as a reminder that we’ll get past them… yet again. R’ Akiva: ***** Gorgeous! It’s awesome when a song reflects a legacy sound, but even does it better, Here we have a Journeys type number, but Shmuly one-ups theirs with an outstanding version of the R’ Akiva life story. Truth be told, however, the chorus should include the word “Rochel”, as the song really is mostly about her heroic support of R’ Akiva. This piece almost brings me to tears every time I hear it. (I fully expect a girls school somewhere to use this as a production song – I can hear the extravagant harmonies in my head…) The graceful piano running the show with the soft strings in the back is masterful. Jerusalem Stone: ***** Another incredible folk-rocker, with splendid wordings, sung with poise and elegance. Lovely work all around, including a great solo at 2:40 and a fantastic lyrical bridge. A touching song that begs to be played over and over. This song makes the album for me. Champions: ***1/2 I envision this song becoming the Jewish version of We Will Rock You or We Are the Champions. However, its emotions don’t mash following the sincerity and depth of the previous two tracks. It’s got awesome lyrics, but the tune bespeaks over-the-top teeny-bop for me. Rain 2.0: *** In what has become another 8th Day tradition*, here’s another second serving of a song. But I don’t believe much got added to the beautiful original – youthful although it was, its amateurism gave it sincerity all its own. I understand the desire to produce a more professional version, but nu… I still like the original better. The rough-around-the-edges Rain 1.0 speaks for itself. Whisper: *** Another Moshiach song, and yet another electro arrangement. The tune beginning the song reminds me of MBD’s Yidden (Genghis Khan), so that’s distracting and the guitar repeats the same rhythmic statements mid-chorus too many times. I’d like to have seen more variety there. Smooth solo, though! 8th Day – life hasn’t been the same since they came along. Keep it up, boys. *We’ve had second helpings of: Rain, Manhattan, Krenitz, Penny and Yarmulkah Blues.